We have a lot of assumptions about the lives of pirates. We imagine them always at sea, sailing on broken-down vessels and spending the bulk of their time singing sea shanties, drinking themselves into a drooling and slovenly stupor. But, that’s a horrible and limited view of pirates. Many have deep care of how they keep themselves, working hard to maintain a clean wardrobe and an appearance elegant enough to make them welcome at a royal court—be it for the Pirate King, the Queen of the Seven Seas, or even a tribal princess from a far-off and magical land! Now, the latter is a pretty crucial one. Who knows in one’s travels when a pirate crew might find themselves in a bay with exotic and quizzical creatures like mermaids and denizens in native garb. Heck, there might even be a handful of tykes who can fly through the air. The land is a mighty mysterious place, after all. And, no matter where a pirate is going to find themselves laying anchor, the principled pirate needs to be in grand garb for any possible occasion. 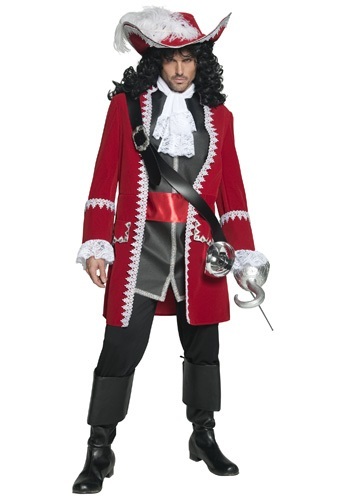 And, as always, we have got your back—and your regal crown—with this Men’s Regal Pirate Captain costume. 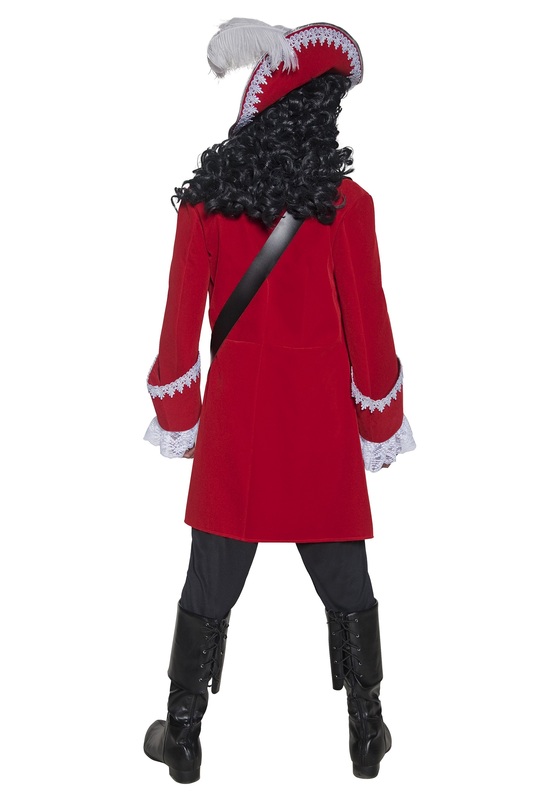 The brilliant red velvet jacket has vivid silver braided trim and lace cuffs that scream that they are the threads of a prince rather than a pirate. But, the rugged faux leather vest with its puffing white jabot and matching silver trim and gleaming red satin sash meet in the middle to make you the perfect balance of high seas and high courts. The cropped pants ensure that you’ll be able to dance a pirate jig or parry a coming blow with equal ease. All you need now is a matching feathered captain hat and whatever accessories befit a captain of your stature and you’ll be ready to pillage whatever hoard is your rightful gain!